Sorry it's been a while - been a bit crazy here. I've not been 100%. But here is a fun card I made a little while ago using another of THESE fab chipboard animals and THESE alphas. I love this cute monkey. Hope your week has been good so far. Aww what a cute monkey :) I love it! 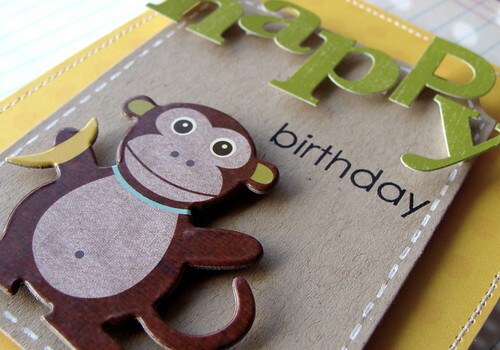 Cute card...love the monkey! tfs! Cute monkey indeed! Very nice card! super cute Lucy. Hope you are feeling better. love those chippie critters...too cute! This is darling, such fun and happy colors!! Hope you are feeling better soon! 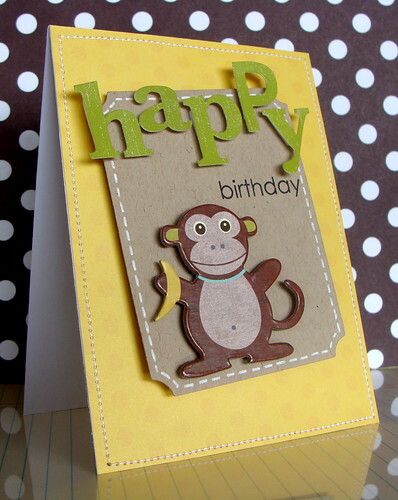 I just love this monkey...wonderful card, Lucy! Hope you are feeling better soon! Cute monkey! This is so adorable! It makes me smile! Cute, cute! Love the monkey. Hope you feel better soon Lucy. Love this! Great stitching and I am adoring the way you have been using alpha stickers lately! Hope you feel better soon! Gorgeous. Love this monkey. Hope you feel better soon.